Sorry for the lack of posts, guys, but my job and my dissertation are both getting too demanding at this stage. 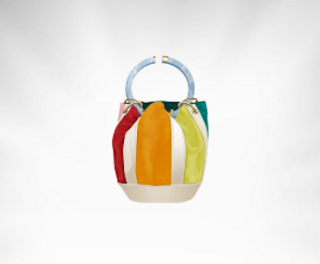 Bonjour Bizou Multi Colred Handbag. Click HERE to obtain this in your dressing room if you haven't already done so. To pay 24sd for a bag that looks like an inverted hot air balloon is a pure joke, and I personally would have to question my own sanity if I ever went and actually bought it. I'm certainly not saying that the bag is bad - in terms of graphics, it's perfect. In terms of the overall idea, it's alright - each to their own. In terms of my personal taste and opinion, I'd say, the handle ruins it. Perhaps a long chain or a strap would look much better. But hey, each to their own, right? So anyway, I'll leave it all for you to judge, lovelies! Did you already buy it while I was missing in my Wonderland workload?